25 pieces of Oldham's creation, an iteration of his original sculpture SkaterBIRD, to be used as unique thank you gifts for clients bringing BIG business to Dallas. "We love what SkaterBIRD represents - Dallas as both bold and forward-thinking - and we want our clients to look at it and remember the great time they had here and the optimism and energy of our city," said Phillip Jones, President and CEO of the Dallas CVB. "It says so much more than a plaque." The Dallas CVB Artist of the Year is a new annual competition aimed at highlighting the local artist community. In November 2015, the Dallas CVB called for artists to submit original creations representative of the spirit of the city, its people and its heritage. 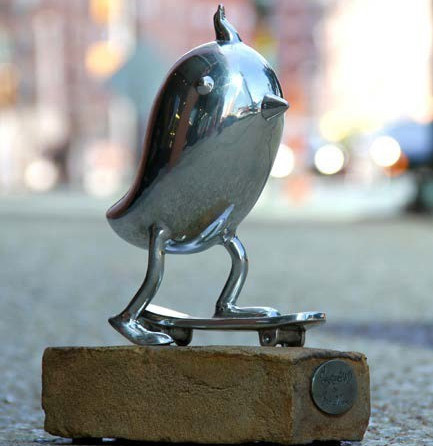 Oldham's submission, a seven-inch hand cast pewter skateboarding bird mounted on a brick salvaged from historic Dallas structures, was selected from a host of compelling candidates. "SkaterBIRD celebrates the leap of faith that artists and entrepreneurs take every day," Oldham said of his piece, which is crafted entirely in Downtown Dallas, from start to finish. Oldham's submission is modeled after his original SkaterBIRD, a 22-foot stainless steel sculpture installed atop his Downtown Dallas store and workshop, and represents the energy and can-do bravado of Dallas' core. looking in the rearview mirror. The SkaterBIRD kicks out doubt. Look at this sculpture and consider how you can live boldly." $1.6 billion in future economic impact for the city. Oldham, a Dallas native, is best known for his iconic Traveling Man sculpture in Deep Ellum. However, many of his creations can be found across Dallas and beyond. Each design, personally crafted by both Oldham and his wife and business partner Christy Coltrin, begins with a story that is meant to inspire, challenge, reflect life and create a sense of place unique to its location. The Dallas CVB will begin accepting submissions for the 2017 Artist of the Year in the fall of 2016. For more information on sculptures by Brad Oldham International, please visit www.bradoldham.com.